Jacob, how would describe your books, their genre? The Heir of Scars series of medieval fantasy novels are epic, grand, sweeping, but are truly focused on the characters within the world of Morandia. The cultures, languages, and societies are organic, personal, and near to our own. Adria, Marcus, Kirlin, Mateko, Darius... they grow, they change, they sometimes contradict themselves, even die. Heir of Scars explores their pasts, their futures... the things that make them who they are and their world what it is— very real, and yet both a little darker and a little brighter than what we are often able to live ourselves. ’Cause, you know... fantasy. How long have you been writing? How long did it take to write your books? And what motivated you to write them? I've been laying the groundwork for these novels for years and only started releasing them in mid-2011 in episodic novellas— one each season. It's an exciting way to write, and I hope an exciting way to read. Can't miss the characters or hang on the edge of a cliff for too long... the next release is three months away at most. The world building for Morandia and the Heir of Scars took the longest— and will continue. It took me hundreds of hours to develop the Aesidhe language alone. It, like the culture, is based on Native North American Indian languages and cultures but is definitely its own creation. Gna chóli wateko limiyati? Heheh... look it up. Is it a stand-alone novel or part of a series? How long will the series run? Heir of Scars was always meant to be a series, and I plotted out 40 releases originally though that's starting to seem too few at this point. I have at least portions of each of the 40 + episodes written, and my style always involves working on multiple time-lines at once. It's not a strictly linear story. Think Lost in the fantasy genre and you'll get the gist. That many characters, that many forwards and backwards, but the past and present, and the intersecting story lines, all inform each other. They're organic and grow together more and more as time goes on, even as new story-lines are introduced. Who are your main characters in the story and how would you describe them? In the first eight releases, I focus on Adria Idonea. 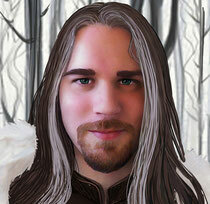 Adria is an heir of the ruling family in Heiland, a medieval kingdom at war with an indigenous people, the Aesidhe. The story begins with Adria as a young woman, having exiled herself among the Aesidhe her father wars against. We begin in the middle of her story, and then followed two strands— one in the present, in which Adria returns to her father's people because of an unbreakable promise, and one in the past, exploring why she left as a child, how she becomes a prominent person among her new people, and leading up to a great conflict between her father's kingdom and the Aesidhe she has come to love. It's a coming-of-age in two times and shows in very different ways the struggles Adria faces in choosing her own way in a world so like our own, too often in conflict. Beginning with Part Nine, Spires and Mountains, I have rebooted the series. Adria's story continues in a very new context, and other stories begin (or begin anew) all across the world of Morandia: Marcus, Kirlin, Darius, Mateko... the world widens, and yet already these lives which span the world converge in past and in present. I'm having so much fun with these now. Is there any symbolism in your book that you’d care to share with potential readers? Symbolism always happens whether it's intended by the writer or not. We're humans. We find patterns in everything around us, whether they exist in a real measurable way or not. We give it meaning. We're all storytellers. One of my characters even remarks upon this at one point as a joke, but here’s an example: I use a game of chess as a symbol, and it will seem at first to be a bit of a cliché, but I flip it on its head. Three times. At least. A reader who notices small but interesting things very early in the books will be hugely rewarded as the story goes on. Promise. Do any of the characters resemble you? How about friends or relatives? Not in any way which might inspire litigation, of course not! I have a huge cast. No one's a direct copy, but of course I've diced up many people I know and strewn them about my world... again in a way that totally won't land me in a courtroom, despite the violently creative phrasing. What is the worst thing reviewers or critics have said about your book? I've had great reviews so far. Very fortunate. I've had readers who have picked it up thinking it's YA fiction, and though Adria is a child or YA through the first eight books, it's really probably too much for many YA readers— especially moving along to Spires and Mountains and beyond. Still, even those readers have been positive. So many people end up with unreasonable low reviews. I've just been lucky so far. What is the best thing reviewers or critics have said about your book? Oh... the best actually is as qualified as the worst reviews. I love when readers get so excited about something that they verge on spoilers. It's a dead giveaway that I nailed a scene, but... well... SPOILER ALERT! Have you tried submitting your book to publishers? If so, how many? Did they provide any feedback? What was that feedback? Will you be submitting it again? Would you still want to work with a traditional publisher now that you have self-published? I tried sending an early draft of the first eight novellas as one novel to an agent; I received a middling response. About this point I realized that Indie publishing and eBooks were becoming much more of a feasible reality, and this just appealed to me, especially as I began thinking of the novels as smaller, coherent pieces. What has been the most difficult part of your writing experience? Dealing with publishers, agents, editors getting reviews, query letters? Do any of your characters have secrets you can share with our readers? Many. What's a good one that's not a spoiler? This will apply to both long-time readers and those starting with Spires and Mountains: Adria owns something once owned by her mother. She doesn't know this, but it's not actually her secret. Wait, are we taping yet? This is just the warm-up still, yes? If you were to be offered a movie deal, who would you like to see play the main characters? And why? Oh, this is a great one! I nearly started weeping when I watched the beginning of Hanna. The opening really looks like it could have been ripped out of Heir of Scars, at least until a gun appears. So, Saoirse Ronan is a near-perfect Adria, and Eric Bana would make an excellent Preinon, as well. It doesn't realistically happen for authors, but I would love to be involved in the casting. Your accent, Nick, would be perfect, actually... what are you doing for 8 months whenever this happens...? Seriously, fill me a pint of whatever. We could talk this out all night. Describe your writing process. Do you outline, create rough synopses, do you do detailed biographies of the characters before starting to write? The stories are complex enough that I have to outline. I use Scrivener now, actually... it's a great tool for long or complicated story-lines. I name each scenes creatively and color code them based upon character and whether it's in the past or present, so I can get a feel for them and see the overall path of the story at a glance. I even use keywords now. It's so scattered. I write in pieces all over the place, rearrange. Each release is about half done as I finish the one before, so I play with the order and fill in the gaps in a three-month period while also writing ahead based upon the new material. It's important to me that I craft a reasonably full story arc for each release, even when there are five main character story lines in nine different times in the span of 25,000 words. It's a great challenge to make it all work together and feel like a whole, but I think it works. How much research do you do before starting to write? Where do you find most of your background materials? How do you fact check? I do quite a bit of research before and during writing. The languages and cultures should make that plain, even when it's often just ten hours of work to produce a small amount on the page that most might not even pick up on. I think it truly helps to make the world feel fully realized. The amount of work I've put into studying American Indian culture, linguistics, medieval and classical history, development of world religions... you have to put a lot into fiction like this, especially to make it be readable and not feel like a collection of Wikipedia articles in the end. If you had to do the experience of writing your work over, would you still write it? Would you change it? How? Oh, I still fidget with little bits. I'm not in paperback yet, so I'll confess I make small changes now and then to the earlier e-book releases. I also did a round of additions... maps, and appendix, new covers... but I made those a second edition. How did you choose the story you wrote? We live in a world where religions, nations, and cultures are too often in conflict, even when the individuals comprising them just want to live their lives, have the freedom to make their choices. Heir of Scars is about that freedom. How does a person live the life they want to live, when so many decisions have been already made for them? Adria and the others are heirs to the war their fathers and mothers waged a generation before, the War of Scars. It was a cultural war, a religious war, and it dictates so many of the choices they have to make—in life, in love, and in choosing how they will leave the world for the next generation. How did you decide on the cover and did you design it or did you use a professional designer? However you created the cover, will you being do it that way in the future? Why or why not? I designed the first eight original covers myself, using stock photos and an increasingly prohibitive amount of Photoshop. I realized I needed a cover artist, and I was fortunate to find Vanessa Bettencourt. With her art and a new font design, I redid the first eight covers and am much happier going forward. Vanessa has been awesome and very engaged in the project, especially considering there's a new Heir of Scars release every 3 months. And I usually only stop writing the day before release, ’cause... eBooks just encourage that level of procrastination. Who were the authors that influenced you? What about them and their style appeals to you? My two biggest author influences are probably Frank Herbert and Katherine Kurtz. They both crafted worlds with a deep historical feeling, and their level of mysticism is the closest to what I adopt. No dragons or fireballs, folks... sorry! I really should say George Martin, but I honestly hadn't read him until recently. He's probably the closest to my current style that I know of, but can't really be called an influence. Something that influenced me unexpectedly and probably more crucially are the new school of episodic television— HBO, etc. You'll definitely see my structure influenced by Lost, some speeches like a medieval version of Aaron Sorkin. It sounds odd, but I'm not a huge reader of fantasy. What did you learn that surprised you while writing your book? What was the most difficult part? Trust the characters more than yourself. That's probably a good answer for both questions. I know it sounds kind of silly. But it’s really the argument of the whole theme. Adria doesn't like to be told what to do. My original ending to the first eight books, well... she didn't care for it and did the exact opposite. Can't write for her... can't write for them. If I let them live and I just watch, it works so much better. What types of hobbies do you have? Are you active in sports or your community? Do these activities find their way into your books? Most of my hobbies are creative, and I try to use them to support the novels— I've written music inspired by/ with the novels, and I'm pleased with the trailer I made recently for Heir of Scars. Of course, chess appears in the novels, and I used to be a decent player. A fascination with languages, also obvious. What is your favorite time of the year and why? And did you incorporate that into your story? How? Wow, that was a banal question you turned nicely into a great one. Since much of the first eight books take place among the Aesidhe, the passage of seasons is instrumental to the story. And I feel like I've actually gained more of an appreciation for winter in part because of this. The Aesidhe make camp for the winter, and they're able to relax and live their lives more in peace. The armies of their enemy don't hunt them then, and they've long since learned to adapt to the cold and a scarcity of food. Adria's story begins in winter. She's barefoot and hunting in the snow... and those are the kind of images that have stayed with me. What do you feel is the best personal quality you bring to your writing career? Dream. A very active un- and/ or sub-conscious. I'm relatively convinced that I wrote all of these novels in a parallel universe, and I just watch the movie when I go to sleep at night. Or in the shower. There. Did the shower things make the answer less cheesy? And how many questions are there? Am I getting that pint soon? Tell us something about yourself that you don’t usually share with anyone but close friends? Do you have a special theme, or design that you intend to continue throughout your career as your signature item? Oh, great question. I haven't thought about it, really, but I will now. Thank you! Hm. I suppose birds as symbols are taken? What happens next? Is there another book? A new career in some other field? What are your future writing plans? Is it dependent upon this book being a success? Well, I can continue writing Heir of Scars for years and will. The characters keep living, with or without success... even without my approval and against my desires, in some cases. At some point I'll start publishing other works, some mainstream fiction, science fiction, even a few musicals I've started. Started a video game. I've already begun more projects than I can ever hope to finish. Like Godel. For every answer I find I have at least three new questions. It's a pretty cool way to live, really. I'll start a book about it. Do you use a pen name? Why? Jacob Falling is absolutely a pen name. It actually developed out of a dream I had while writing a novel. I was actually a character within this dream, and the character was dreaming (yes, this was long before Inception... haha). He was playing chess as the white pieces against an unknown enemy, and gradually became one of the pieces, moving on a chessboard that seemed to be a purgatory of sorts between heaven and hell. He lived a lifetime on the board, sometimes being black, sometimes being white, always trying to either climb his way to heaven or to hell, just... elsewhere. But he always fell. In the end, he lay down upon the board, and he dreamed. In this dream within this dream within a dream, he rose and folded the chessboard and pieces under his arm, and ascended a silver stair. When he reached the top, a faceless gray angel stopped him. “What is your name?” the angel asked. End of dream. And dream. And dream. End of story. Of course, there's a Gnostic version of the Biblical story of Jacob's Ladder in there, and the concept of the name is simple for me: We struggle within and against ourselves to be more than ourselves. We fall and fall and fall, always and only fearing a world without ourselves. Thanks for this opportunity, Nick... great questions. Lots of fun. Source: Wale, Nick (2013-11-06). Novel Reads by Novel Ideas November 2013. Kindle Edition.